I picked up this book at my local library only because I feel in love with the cover. Now I know sometimes a beautiful cover on a book does not always mean the book will be great and it makes people wonder if they should buy or read a book strictly on what the cover looks like and while I had my doubts going into this book if I would like it or not. 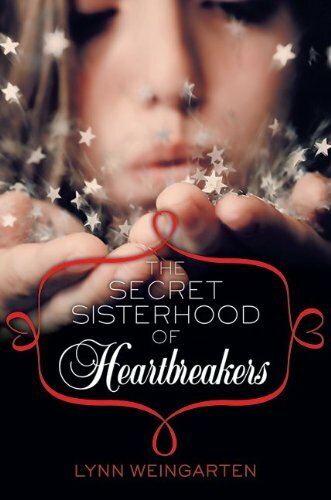 I am SO glad I decided to pick it up that day at the library because The Secret Sisterhood of Heartbreakers is as amazing as it's cover. I so feel in love with this book with each and every page I read. I read TSSOH in a day and a half. I just could not seem to put it down. The story-line was flawless and intriguing. The character's in the book where likable and interesting. I just found this book to give the reader such a unique tale, and not your average typical paranormal romance novel but something I know that I have never read about before. Just sometimes I can get tired of reading the same type of books all of the time and while those books are fun to read sometime you need a change - a breathe of fresh air; per say and I do believe this book is it. I have never read any work by the author Lynn Weingarten before, heck I had never heard of her until I found this book at my library but I must say she is a brilliant writer. I so hope that Lynn decided to write more books because I would so read them. So, I know I did not go into what the book was about but you can basically read about that in the into above - I mean all you need to know is that this is one of those books you will so be glad you picked up and not just for the gorgeous cover but for the masterpiece that lies within the pages! Nice review! I agree, the cover is very nice. I'Ve been wanting to read this book since someone compared it to the Traveling Pants series which I adored. Great review Beckie! I like your review. It's a great story. Your blog is attractive. Don't forget to follow my blog!